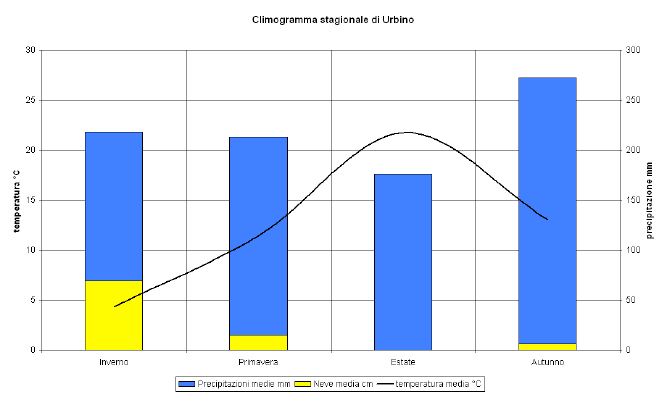 Urbino has a sub-continental transition climate. The city (average altitude 450 m a.s.l.) rises on hills that act as a watershed between the Foglia basin to the north and the Metauro basin to the south, and it is located in a wide, open environment with various influences: Apennine on the one side, and influences of the Po plain and mainly maritime ones on the other. A windy city with a medium-high humidity level (71%), characterized by gusts of wind mainly from the south-western quarter that, during the year, exceed 100 Km/h 10 times on average. The average annual temperature is 12.6 °C with winters that are not particularly cold (average 4.3 °C) but often accompanied by snowfalls, sometimes quite large (average 69 cm). 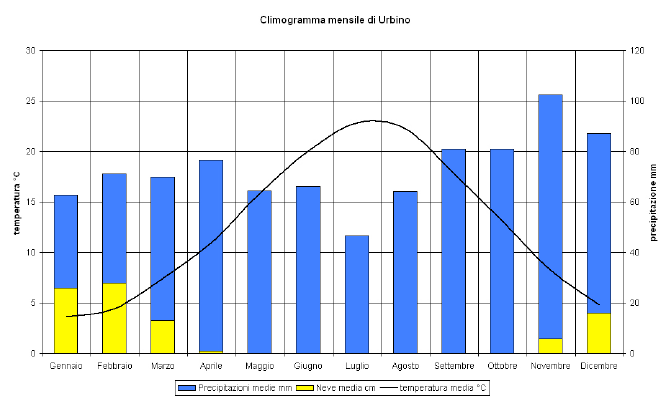 Rainfall, more abundant in the autumn, is anyway well distributed throughout the year, with less in the summer period, but very similar in the winter and spring. Summers in the last 20 years have often been torrid between the last third of June and mid-August, with late summer warm spells in September.